We have been exploring how to develop Ribbons for Microsoft Word, Excel, Powerpoint and Visio. I have tried to avoid any contact with Outlook 2010 because this piece of softaware has been built in a different way in the new Office 2010. Basically, Outlook 2010 is a mixture of Outlook 2003 with Outlook 2007. That means it keeps almost the same core but with extra functionality. The best way to see this it is by looking at the User Interface. 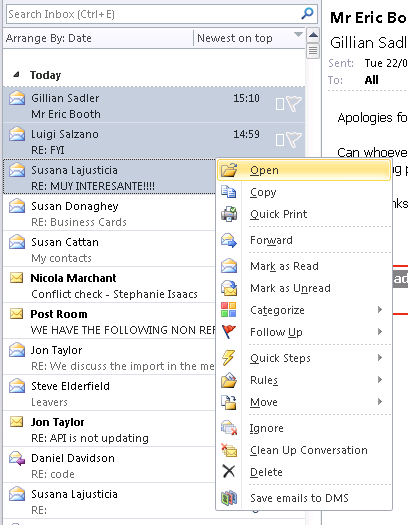 In the Outlook User Interface you can combine command bars and Ribbons, so you can still using your old addings, and if you want you can incorporate more. As you remember we are integrating Sharepoint 2010 with Office 2010. We have the case we have some lawyers want to save their emails to a client/matter structure in Sharepoint 2010. They also want to be able to insert attachments from Sharepoint and save them. For all these tasks we have to provide them a nice and simple User Interface where they will only type the client and number and click Return. - A button in the main Home ribbon so if the select an email or few of them it will launch a form to ask you where you want to save the email. 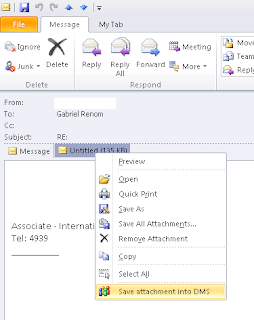 - A button in the "New email-Ribon" to insert attachments from Sharepoint. 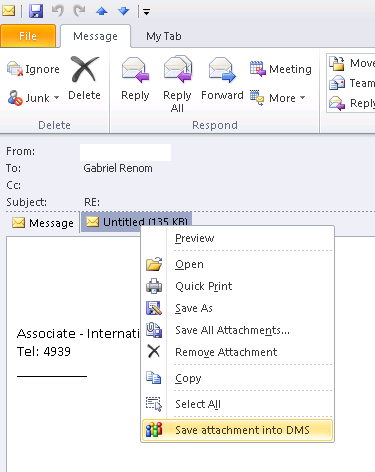 - A context menu in the "Open Email" to be able to save the attachments. 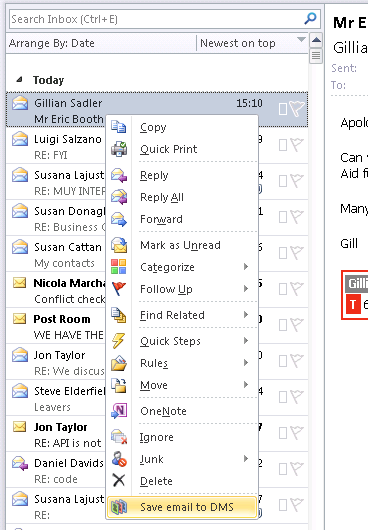 - A context menu in the email selection to be able to save a bunch of emails in one go. The main problem with this is to insert a button in built-in tabs and context menus. We have to be sure we can accommodate the buttons properly. 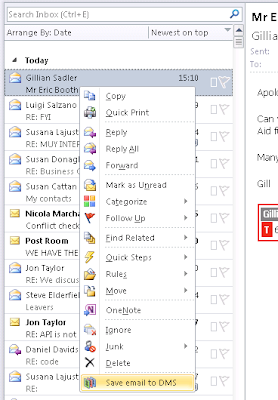 We are going to concentrate in building ONLY ONE button in the TabMail Ribbon. This button will open the form. We will start building the XML file from the scratch so you can see what is going on. <button id="CMDSaveEmailToDMS" label="Save Email" imageMso="AccountMenu"
<button id="CMDSaveEmailToDMSreadEmail" label="Save Email" imageMso="AccountMenu"
<button id="CMDInsertAttachmentFromDMS" label="Insert Workspace Item" imageMso="AppointmentColorDialog"
In order to save the file into the DMS we will create a context menu, so the user can go to the attachment an "do" a "right click" on the attachment, and a new option called "Save attachment into DMS" will be displayed. Don't worry about the functionality behind, we will cover all of that in the next chapter, in fact we will go trough the process of creating a new project in Outlook 2010. Right now we are focus in developing the right User Interface for our DMS. I am not enter in detail of how to develop context menus, because I assume that after checking the ribbons, context menus is a piece of cake, but I have to accept that the big issue here it is to integrate built-in context menus with your items. For that we will use the "idMso" attributte. We just need to pass the name of the context menu we want to use. In this case the idMso is called ContextMenuAttachments. To find out the name of the built-in context menus, download this add-in (http://archive.msdn.microsoft.com/contextmenusaddin), install it so everytime you do a right click it will display the name of the menu at the end of the context menu. Now, I am going to create another two buttons in a context menu. Basically with this option, you will be able to select and email or more do a right click and save it/them into Sharepoint 2010. To produce the whole User Interface we have finally developed this CustomUI XML file we will use later on. Please have a look to the context menu part, because it can be applied to any Office 2010 product. Conclusion: We have learnt how to interact with the Outlook 2010 User Interface using the Extensibility.IDExtensibility2 and Office.IRibbonExtensibility class. 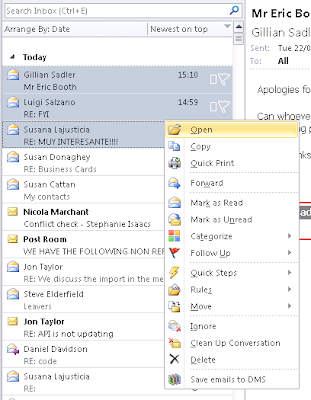 In this way we can avoid any interaction with the old commandbuttons object from Outlook 2003. By doing this we are developing an addin compatible with 2007 and 2010, but not with 2003. The advantage is translated into perfomance and stability.